Scanning electron micrograph of the SQUID ring with step-edge Josephson junctions. Magnetometers based on dc SQUIDs are currently the most sensitive sensors for magnetic fields, achieving a magnetic field resolution which is about a billion times below the earth’s magnetic field. A dc SQUID basically consists of a superconducting ring interrupted by two weak links called Josephson junctions. A current that flows through the junctions and is greater than a critical current leads to a voltage drop across the junctions. This voltage is a periodic function of the applied magnetic flux. Therefore a SQUID can be viewed as a flux-to-voltage converter. Basic operation principle of a SQUID as a flux-to-voltage converter. The signals to be measured are magnetic fields. These are only poorly detected by a bare SQUID, due to its small inductance that cannot be increased for low-noise operation. For this reason large area flux antennas are needed, which couple the detected signal efficiently to the SQUID. If the flux antenna is integrated on the same chip as the SQUID, the device is called an integrated magnetometer. Central part of a directly coupled SQUID magnetometer with the SQUID-loop. The large pickup-loop of nearly substrate size is not shown. In the directly coupled magnetometer layout, a large pickup-loop acting as the flux antenna is galvanically coupled in parallel to the SQUID-loop. This coupling scheme has low efficiency, because of the large mismatch of both inductances. However, the directly coupled magnetometer is very attractive, due to its simple single-layer preparation process. 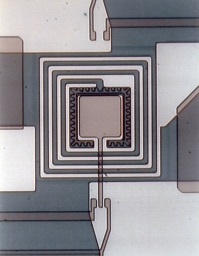 Input-coil integrated on top of a square-washer SQUID of an inductively coupled magnetometer. For the inductively coupled magnetometer layout, the efficiency of flux coupling to the SQUID is about one order of magnitude higher than for the direct coupling scheme. For better inductance matching, a so-called flux transformer is used. 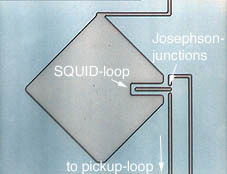 The large pickup-loop is connected to a small input-coil of several windings, that couples inductively to the SQUID. 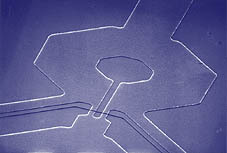 The figure above shows the input-coil, which is integrated on top of a square-washer type SQUID in a YBa2Cu3O7-SrTiO3-YBa2Cu3O7 multilayer technology. A multiloop SQUID magnetometer. The diameter of this device is 8.5 mm. A completely different approach, but with the same high efficiency, is the multiloop magnetometer. The SQUID ring itself is enlarged and it consists of several identical pickup loops, which are connected in parallel to reduce the inductance. The 16 loops are arranged to the cart-wheel like shape of the device, that can be seen in the figure above. Again, a multilayer technology is needed for the preparation. The input coil of the IMPUC magnetometer. The 4-fold pick-up coil is connected with the 4 dark pads. Real-time magnetocardiogram recorded with a multiloop magnetometer. In our group we focus on the development of integrated magnetometers from HTS for the use in magnetocardiography (MCG) systems. The sensitivity of today’s magnetometers is high enough to allow the recording of high quality magnetocardiograms, as is depicted in the figure above. In contrast to the classical electrocardiography (ECG) method, MCG systems work without contact to the body and additionally allow the spatial reconstruction of the current paths on the heart muscle with a large diagnostic potential. This is under clinical evaluation. Noise spectrum of the magnetic field noise in an industrial environment, measured with an unshielded multi-loop magnetometer. The magnetometer’s intrinsic noise level is several orders of magnitude lower. The sensitivity of a SQUID magnetometer is limited by noise from environmental electromagnetic sources and from noise sources in the magnetometer itself. The level of environmental magnetic noise signals is usually several orders of magnitude higher than the level of the signals to be measured. The above figure gives an impression of the noise levels involved. Therefore most biomagnetic systems are operated in heavily shielded rooms. Noise from the SQUID’s Josephson junctions can be reduced by special electronic readout schemes. However, noise produced by flux line hopping in the superconducting thin-films is detected like an external signal and cannot be electronically suppressed. Single-layer magnetometer patterned with holes for noise reduction. 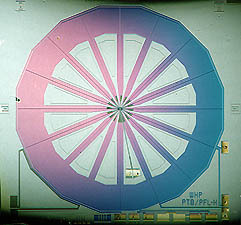 A novel preparation technique is used to prevent the flux lines from penetrating the superconductor. The body of the magnetometer is patterned with holes in such a way that it is energetically advantageous for the flux lines to stay outside of the film. A serial array of 21 Josephson junctions on a bicrystal grain boundary. Highly sensitive magnetometers can also be prepared from arrays of many Josephson junctions in series. The principle of operation is based on the magnetic field dependence of the junction’s critical current. The resulting amplitude of voltage modulation linearly increases with the number of junctions, whereas the noise of the device increases only with the square-root of the number. A further increase of sensitivity is gained with flux-focusing superconducting areas closely adjoining the array. The devices are prepared from single YBa2Cu3O7 thin-films on bicrystal SrTiO3 substrates.